The Program Management Office, more commonly known by its abbreviation PMO, is a centralized team within high-performing organizations. It has the responsibility of defining project management standards, as well as maintaining them and ensuring that projects within the organization adhere to them. This is an important entity for organizations to succeed. A statistic worth noting is that 65.8% of the top organizations have a well-established PMO. The top-most PMO function is reporting project status to upper management; this constitutes 83% of its activities. The PMO develops a standardized and consistent management process that all projects within the organization must follow. Project managers in various business units seek guidance and support from the PMO on implementing the processes defined for project management. Various training programs are held by the PMO to educate the organization’s project managers across business units about the new processes. This team also collects requirements from external companies. A pool of available project managers is maintained by the PMO; when any project is in need of a manager, they can get one from this centralized office. The PMO keeps track of best practices followed by projects within the organization as well as those recommended for the industry, and then shares them with all the employees. They act as mentors and internal consultants. 69% of projects fail because project management methodologies were followed incorrectly, or not followed at all. 32% of project failures are attributed to the lack of a sufficient implementation level of project management processes. 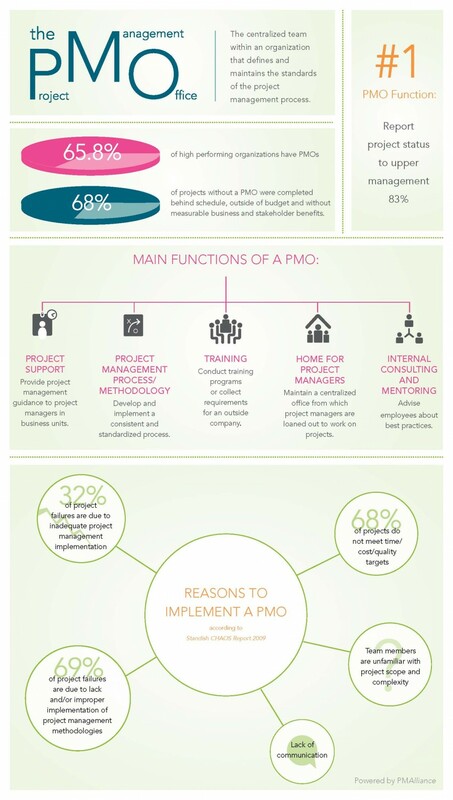 68% of projects that do not have a PMO can neither deliver on time nor within budget. The quality targets and expectations of stakeholders are not met, and there is no measurable business benefit to the organization. Project managers, especially those handling bigger projects or those newly appointed to the role, have so much to do in such limited time that they cannot manage to communicate effectively with all stakeholders on their own. Being placed at a central location in the organizational chart, the PMO does away with the lack of communication. Besides the external communication, the project manager needs to pass on important project information to the team members before kicking off the project, and at regular intervals during its progress. While expected delivery date, planned tasks and efforts are communicated, parameters such as scope and complexity are often missed out. The PMO ensures that each team member has all the necessary information to get the job done. All these statistics and facts prove that every organization must set up a PMO if its business benefits are to be achieved.